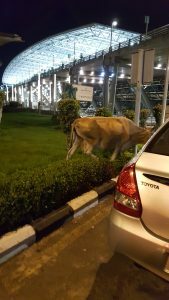 Upon arrival into India, as we stepped out of the airport into a wall of humidity, we were met with a huge crowd of people all staring at the group of delusional and sleepy foreigners. I was unsure what they were doing there at first but it seems like some were waiting to pick up passengers, as usual in airports: holding out their papers with the person’s name scribbled on it, or they were waiting for their family members to arrive. It was surprising because the families were gathered outside standing and not inside air-conditioned cars like you might see in the U.S. and Canada (the two airports in which I have most frequented). 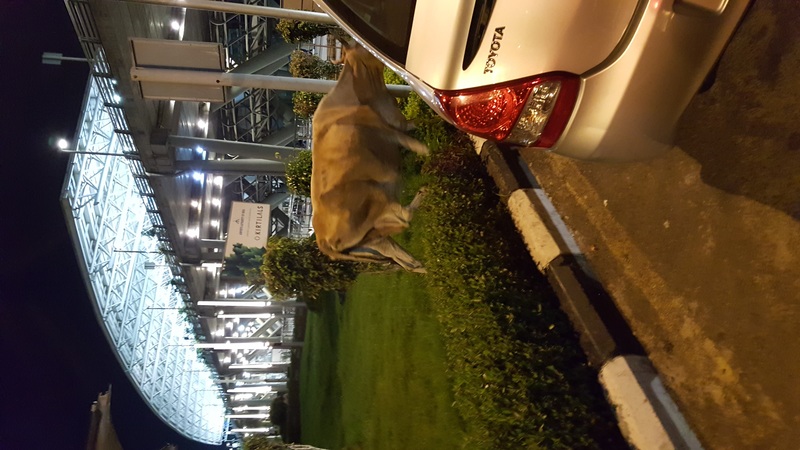 As we got closer to the bus that would transport us into Madras Christian College (MCC), we saw our first cow (of many more to come). The cows and dogs are everywhere in all kinds of health conditions, but generally they seem not healthy. Which, like the poverty I see around me, bothers me because I am helpless to even begin to help. I will likely touch on poverty in some later post so look out for that. In such a highly populated city, full of different kinds of animal vectors: cows, dogs, humans, squirrels and whatever else is here that I haven’t seen, as well as the poor sanitation levels of the area, its like Disney but for for disease–not the best place to be in for the slight germaphobe in me but India is an amazing and interesting experience none the less. With that said, after we settled in to MCC, I realized that I needed many more anti-malarial pills than I had with me (aka no pills) I didn’t realize that I needed one pill a week for the duration of weeks that I was supposed to be there which makes sense. I need to keep up my defenses against malaria while I am here as well (duh, Heather the bio major). Back in the states Heather somehow figured the six pills that I got back home were all that I needed, 2 pills for two weeks before traveling to India and 4 more pills for the next 4 weeks after I get back. I somehow figured that the pills were to just kill the parasite if it existed in my body after I came back. However, malaria has a variable incubation period where signs of malaria can range from a week after you’ve been exposed to months after you’ve been exposed so you really should be taking care to not get bitten by putting on bug spray and staying away from breeding zones or in times of extra mosquito activity. 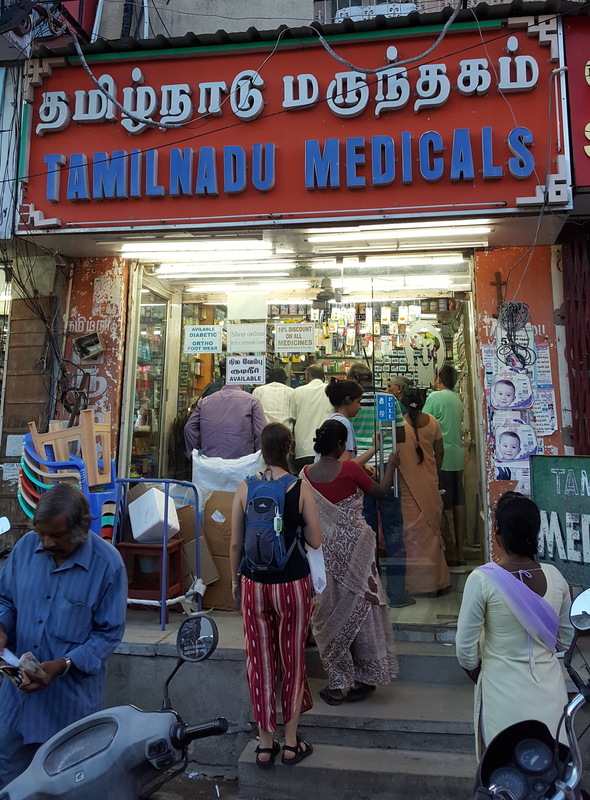 Once my mental whoopsie hit me, I started to search for antimalarials in the many chemist shops, India’s equivalent of pharmacies, that are dotted throughout India. I did not want to test the mosquito breeding, and more importantly biting, ground capabilities of this so far frequently rainy and population dense area. Chemist shops are really cool, I like that they seem to be less streamlined into big corporations, which might not be the truth and only my imagination that they aren’t affiliated with each other. Never the less, it is refreshing to see this kind of difference from the U.S.. 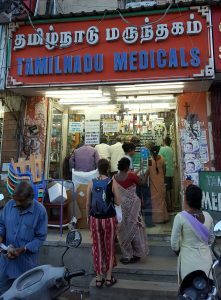 There are definitely corporations but some of the regular family owned looking stores seem to know each other, as every time I went in looking for malarial pills, they would send me to one two or three stores down which, although frustrating, was also interesting. I think that’s what’s cool about it, that they seem to be very much locally owned and operated except for some like Apollo drugs, that seems like one of the bigger names. On the hunt for the ever elusive malaria pills, one of the stores and I think the clinic here suggested chloroquine as the antimalarial drug to take. Being curious and worried about the drugs that enter my body, I looked up what it was but found that at some point, one of the parasites that transmit malaria, p. falciparum, has shown resistance to chloroquine and that that specific parasite is prevalent in most of India. Now, that study is many years old and so it might be okay again to take chloroquine to combat malaria but the fact that it was resisted against at some point turned me off to even getting it. I’d prefer not to take chloroquine and would much rather prefer Metakelfin, which combats malaria by inhibiting the germination of the parasite using the two different drugs that make it up. Metakelfin is an Indian produced drug prescribed by a friend’s mother who is a doctor here. Or, I could take Mefloquine (brand name Lariam) which was what I had taken from back home and apparently causes toxic waste buildup in the parasite that eventually kills it. Thus far, the search is unsuccessful but I am still hopeful that I will find it somewhere here some time soon, preferably. Stepping back and thinking about all the things I had to go through to try and see what would be best for my paranoid self, I can better appreciate the level of education that I was lucky enough to have as well as my status as a person coming from an affluent country and a currently solidly middle class family. Because of my education and status, I was able to figure out my risk levels by reading and mostly understanding the research (I don’t profess to have understood it all because gosh its dense and dry sometimes). Without my status and ability to go onto the internet to look things up, I would be left totally in the dark, perhaps less paranoid, sure, but also more susceptible to sickness.